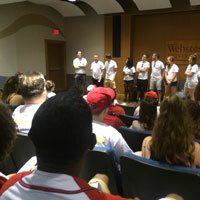 The Office of Admission, in collaboration with the Webster Alumni in the Community group, hosted a Summer Send-Off for the Webster Class of 2020, with more than 125 incoming freshmen and their families hearing from Webster graduates and Admission staff to help them prepare for life at Webster University. The event began in the Arcade Building of the Gateway Campus on June 19, where new freshmen entering in the Fall 2017 semester and their guests enjoyed a welcome from the Office of Admission, followed by an interactive game hosted by Alumni in the Community, and a talk from Billy Ratz, director of Parent and Student Advancement. The group then moved to Busch Stadium to watch Wakeel Rahman, BA ’13, member of the alumni board of directors and co-founder of Alumni in the Community, throw the first pitch. Cardinal’s short stop Greg Garcia caught Wakeel’s strike. Guests enjoyed hot dogs and sodas while watching the Cardinals take on the Texas Rangers and left feeling even more excited to join the Webster community this fall! 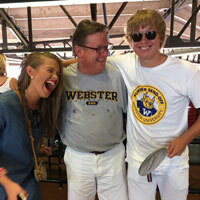 Click here to view more first pitch photos on Facebook. 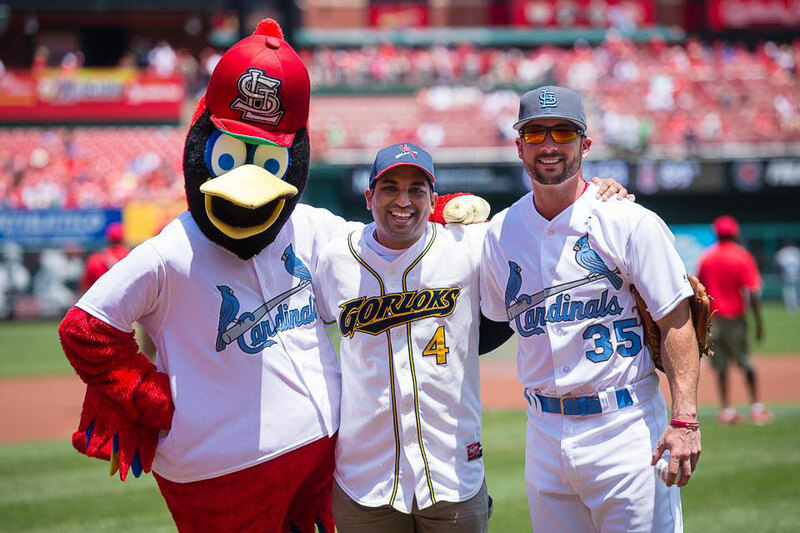 Webster alumnus Wakeel Rahman BA'13 with St. Louis Cardinals mascot Fredbird and shortstop Greg Garcia. At the Arcade Building, alumni discussion topics included housing and roommate situations (both best- and worst-case scenarios), advice for commuter and resident students on ways to have a fully engaged and rich campus-life experience, the benefits of studying abroad, the numerous student organizations and leadership opportunities available to students, and what it means to be a student-athlete at Webster. Alumni in the Community is a very active group of young alumni in the St. Louis area who focus their efforts on community service and professional and personal development. One of their activities is assisting in Webster’s admissions efforts by engaging with potential students at events such as preview days and recruitment fairs.